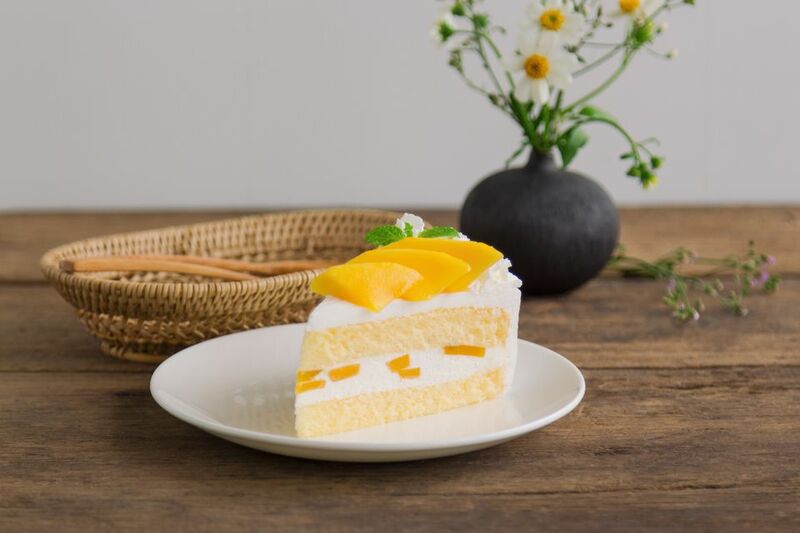 In Thailand, mango cakes, like the one featured in this recipe, are served at all the big hotels where chefs add ornamental garnishes prepared with fresh mango and coconut. Here the process is simplified with the traditional taste that can be compared to strawberry shortcake except with the exotic taste of mango. Mangos can be purchased fresh or you can use canned mango. Either way, this is the perfect summer cake to brighten up a picnic, potluck or any kind of get together and everyone will be sure to love you for making it. This Thai mango cake recipe is so fresh, fluffy and delicious; plus it's fun to make. Heat oven to 325 F. Line two (9-inch) cake pans with parchment paper and set aside. In a large bowl, beat eggs and 1 cup sugar on high speed 4 to 5 minutes or until a ribbon forms when you stop and lift beaters from the batter. On low speed, add coconut, then gradually add flour, baking powder, salt, melted and cooled coconut oil or butter, and 1 teaspoon coconut or vanilla extract. Avoid over-mixing. Pour batter into prepared pans distributing evenly. Bake 30 to 40 minutes, or until an inserted fork comes out clean. Run a butter knife around the circumference of each pan to loosen and then leave in pans to cool completely on wire racks. Meanwhile, in a large bowl, beat cream cheese with 1/3 cup sugar and 1 teaspoon coconut or vanilla extract until smooth. In a separate medium bowl, whip the cream until stiff peaks form - about 6 to 8 minutes. Fold whipping cream into cream cheese a little at a time. Gently remove cakes from pans. Place 1 cake on a plate and spoon over some of the cream - about 1/2- to 1-inch in thickness. Top with 1/2 of the diced mango. Gently set the second cake on top and smother with cream. Add cream to cover the sides of the cake. Decorate with more fresh mango and your choice of other fruit — blueberries, blackberries, red currants, and strawberries. Cake can be assembled up to 4 hours in advance. Store in the refrigerator for up to two days.